Formula 1 is poised for an intensely competitive season according to McLaren sporting director Sam Michael. Michael says all but two teams have cars within a second of a lap of each other. "You've got nine teams within a second," he said. "That is going to make it close. It will make it extremely tight through the qualifying sessions in Melbourne." Michael said that Mercedes were "fast" and McLaren would be "in the mix". With the season starting in Australia on 17 March, Mercedes drivers Nico Rosberg and Lewis Hamilton impressed with the fastest times on the final two days of pre-season testing in Barcelona at the weekend. Rosberg, who set his time on Sunday, was fastest overall, ahead of Ferrari's Fernando Alonso and Hamilton, who set his time on Saturday. McLaren driver Jenson Button was third fastest, 1.314secs slower than Rosberg. "You can clearly see Mercedes are fast," Michael said. "They have been fast all the time. They look like they've got their car together. "Behind that, it's really difficult to see anything else. When everyone is on the same tyres, you still don't know where the fuel loads are and you're not going to know that until qualifying in Melbourne and we'd be kidding ourselves if we thought we knew." 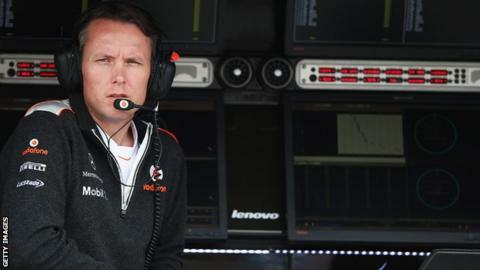 Rivals have suggested that McLaren are a little behind the front-running pack of Mercedes, Red Bull, Ferrari and Lotus. But Michael, who says that McLaren spent the winter ensuring they understood a new car that has several new design features on it, including front and rear suspension, chassis design and the sidepods, disagrees. "We'll definitely be in the mix," he said. "In terms of confidence of whether we can be on the front row and win in Melbourne, I just don't know. "I wouldn't say I was confident or unconfident. I'm neither way, just because I'm being honest. We just don't know."